The title says it all I think. They are marketed as Halloween balloons as on the packaging it states " inflate balloon inside a pumpkin ", but can be used for any occasion. Tesco leytonstone, Gainsborough Road, London. That easily trumps this deal. which wilko? 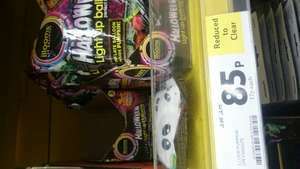 Wilko in Corby, Northamptonshire, they had loads couple days ago, and other Halloween stuff with prices from 5p to 20p.